Intel Core M was launched in mid 2014 and arrived in products during the 4th quarter of 2014. It’s targeted at fanless designs including thin and lightweight tablets, 2-in-1’s and other designs that require thin, light and fanless qualities. 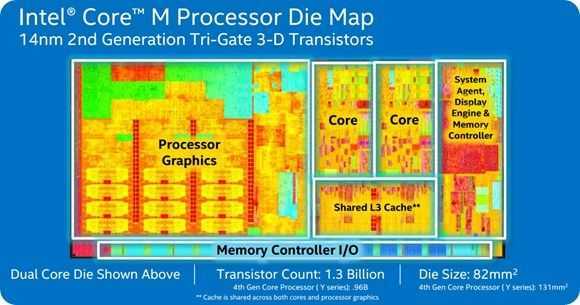 Core M is a highly dynamic CPU built on the Broadwell 14nm process and includes improved graphics architecture, sound module and re-engineered Turbo Boost design. It has a low base clock frequency but can boost up to over 2xthe base frequency if there’s enough thermal headroom available. If the PC warms up too quickly, Core M will throttle down quickly to prevent the design from heating up – important in tablets. The list below shows the mobile PCs we have in the database that are under 1.3KG (2.8 pounds) in weight. Devices will be added as the specifications are announced and as products arrive in the market. Not all variants of a product is entered into our database.